Once upon a time there was a little princess and her name was Bluebell. Princess Bluebell lived in a country very, very far away. Princess Bluebell was a very good little princess, but she had one big sorrow in her heart. She was always scared because she didn’t feel like a real princess. Now, maybe you can say that she wasn’t exactly what you call royal, but to her mother and father and all the little animals who lived in her house, she certainly was a real princess. Princess Bluebell looked at herself in the mirror every night and said: I don’t feel like a real princess. And I don’t believe that I am. My hair is not golden enough, my face is not fair enough and my eyes are too dull.” Princess Bluebell felt that all real princesses should look like the ones in her fairy books. She thought that the princesses in her fairy books were so beautiful! Every day Princess Bluebell felt a little sadder, and soon everyone in the house picked up on her sadness. Her mother stopped singing in the kitchen; her father had a worried furrow between his brows, and all the animals: the little white bunnies, the black puppy and the ponies in the stable started hanging their heads, for even they felt so sad for the princess. Princess Bluebell stopped wearing her pretty dresses and combing her beautiful hazel brown hair and the shine from her eyes lost its sparkle. Then one day something peculiar happened. There was a short knock on the door. Princess Bluebell came to open the door, but to her surprise she saw that there was no one there, she was just about to close the door again, when she saw a little parcel wrapped in silver and golden wrapping paper. She picked up the parcel and read the gift tag that was fastened with a pink ribbon to the parcel: To Princess Bluebell, it said. Now this was very peculiar indeed, for it was only Princess Bluebell’s mother and father and the animals who knew that she was Princess Bluebell. The little princess took the parcel to her room and unwrapped it. Inside was a beautiful mirror! The frame was painted in gold and there was a tiny golden angel sitting on the side of the frame. It had a very pleasant and peaceful smile and the eyes seemed to be shining with love and compassion. Princess Bluebell absolutely adored the mirror. She took down the old mirror and hung the new golden mirror it its place. That night when Princess Bluebell was going to bed she looked into the mirror as usual to see whether or not she had become beautiful like a real princess. The little princess closed her eyes and said to herself: “I wish I was beautiful like a real princess”. Then she opened her eyes and looked into the new golden mirror. At first nothing happened, she saw only her normal face looking back at her. But then all of a sudden the mirror reflection started to change! Her face disappeared, and lovely colors started dancing around inside the mirror. It lasted only a few seconds, and then it changed again, she could now see herself, not the reflection of her face, but she could see herself feeding the animals, patting them and singing to them, helping her mother in the kitchen, washing dishes and cutting vegetables, reading to her father and stroking his big rough cheeks. Then all of a sudden, an angel appeared in the mirror, it looked very much like the angel that was sitting on the frame of the mirror. 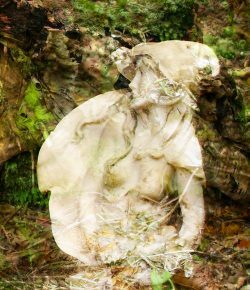 The angel disappeared as suddenly as it had appeared and then the magic mirror was back to just being a mirror again. Princess Bluebell could again see the reflection of her face, but now it was looking differently. Her eyes looked like they were sparkling, and the little princess could see that her hazelnut brown hair was really beautiful and shiny and her face was glowing like gold! 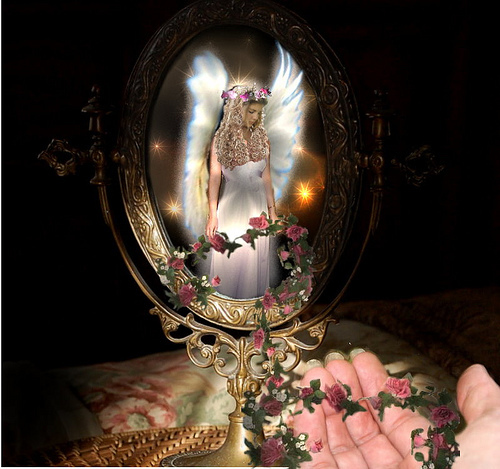 The little angel on the side of the mirror was looking down at her with its peaceful and loving eyes, and it was as if the angel was smiling especially brightly. The little princess smiled back. She knew now what true beauty was and that she indeed was beautiful. “I believe”, she said to the girl in the mirror, who was of course herself, and as she said those words, she could feel inside that she was a real princess. From that day onwards Princess Bluebell was happy again, and that made her father, her mother and all the animals happy too! The little princess never doubted herself again, and if she did, all she had to do was to look into the magic mirror and her faith was restored. Wouldn’t it be nice if we all had a magic mirror like that? Wouldn’t it be lovely if some of these stories were available to buy in book form Trinni, please let me know if you publish any of these or if any are available in ebook form; the stories and pictures are so beautiful. Kathy.